John has trained yearlings, managed training facilities, provided medical care and worked as an assistant to farrier's and vets. 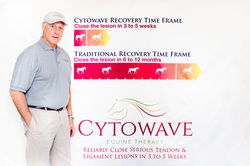 John brings a love of the equine world and many years of a variety of sales experience to the Cytowave team. Emily and Mike Jewell own a small farm in southern Indiana and they breed and raise Friesian and Andalusian horses. At any given time they care for 10 or more horses, a few of which are Friesian and Andalusian mares.